If I had to pick one thing that most enhances wellness, improves quality of life, and allows for longevity and anti-aging it would be this: Get a chiropractic adjustment every week! This will keep you and your nervous system healthy. I have not missed a week in 35 years. Your nervous system controls and coordinates the functioning of your body and mind. If your brain can talk to your body, you can heal yourself on a regular basis. A 5 minute, properly done, chiropractic adjustment can increase your immune system function, increase endorphins, (the feel good hormone) decrease cortisol (the stress hormone) by 20%, and increase your testosterone by 25%. There is NOTHING else that you can do that can do that for your health in so short a period of time. Understand that the body is self-healing, self-organizing, self-regulating and with the right input is capable of healing from almost anything that is going on. Avoid the medical system and pharmaceutical drugs whenever possible. They are great with infections, fractures, traumatic injuries, emergency interventions, etc. But they tend not to understand how the body heals itself. Medical mistakes during surgeries and medical procedures and adverse reactions to properly prescribed drugs are the number one cause of accidental death in the U.S. The #1 Cause of Accidental Death in the U.S. – Are You at Risk? Eat the best clean, organic, free range, grass fed foods. Do not eat any foods that have genetically modified organisms (GMO’s). You will have to do some research here. The U.S. is the only country in the world where GMO’s do not need to be labeled on your food. Almost all the corn and soy in the U.S. is GMO. Consume a preponderance of fruits and vegetables as the cornerstone of your diet. Eat for health and live for joy. Have good thoughts and use your thoughts to create your perfect life. Visualize the life you desire before your feet hit the ground each day, as if you are already living it. Start each day being grateful for all that you have. Think of everyone and everything you appreciate in your life. Move your body every day through exercise. Do Tai chi, Qi Gong, Yoga, lift weights, do something aerobic. Listen to your body and don’t overdo it. Get out in nature. Take walks at the beach and in the woods. Ground yourself by walking barefoot. Get negative ions from the beach and ground. Get Educated on what “Healthy Food” really is. Many people think they are eating clean and yet have no idea what they are actually putting into their bodies. If you think about what you want you get more of it. If you think about what you don’t want you get more of that. The main reason people get more of what they don’t want is that they spend more of their time thinking and talking about this. 50 million people in the U.S. have an autoimmune problem and/or a problem with mold toxicity. Have your blood checked at least once a year by someone who knows how to read it properly. Take supplements, herbs and make dietary changes to correct any imbalances. Get your house and your body cleaned up from the mold. Most if not all health concerns that people are prescribed medication for can be healed naturally with proper nutrition, supplements, homeopathy, herbs and bodywork. Most at a fraction of the cost and with no harmful side effects. Do your best to stay off prescription medications. They all have effects and side effects. Get 7-8 hours of deep nourishing healing sleep every night in a completely dark room. Take a nap every day. A 20-30 minute nap in the middle of the day is like getting an extra 2 hours of sleep each night. Drink a lot of water every day. Decrease your intake of sugar and high fructose corn syrup (read labels – it’s in everything today). Read labels of foods before eating. If you don’t know what it is or cannot pronounce it, don’t eat it. Do deep breathing exercises every day. Have happy relationships with friends and family. Have a purpose in life that is bigger than your self. Forgive everyone in your life for everything that you feel was done wrong to you. Ask for forgiveness from everyone that feels you have done something wrong to them. Be present in all that you do. (Read ‘The Power of Now’ and ‘A New Earth’ by Eckhart Tolle). Ask for hugs and give them regularly. Don’t take the small stuff so seriously. Explore new things that can enhance the quality of your life. BE HAPPY! Make a decision that nothing is more important then being happy and finding happy thoughts to think! Play with your pets. Cuddle with your kids/grand-kids or spouse. Look for new & interesting things to do or explore! Have as one of your goals to be healthier, happier, and in better shape next year than this year. Do this every year and you will be one of the few who gets better each year rather than going down the tubes as you get older. You can get better and healthier as you get older!!! Add things to this list as you think of them. Now you are doing everything a person can do to enhance their health and wellbeing to allow for the potential to live a long, happy and healthy life. All the research today is showing that it’s not your genetics but your epigenetics that determines your health and longevity! Epigenetics are the environmental and lifestyle factors that turn on and off our genetic potential. 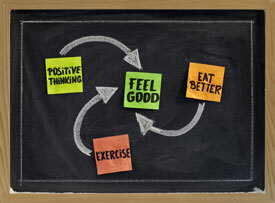 By living the Wellness Lifestyle, you are giving yourself the best chance possible for a long, happy, healthy life! Contact us today to begin your journey to wellness.